Call us biased, but we think Los Angeles is the global hotbed for mobile app development. We’ve been in the Silicon Beach tech scene since its inception, and we’ve scene plenty of startups succeed and fail. If you’re ready to throw your hat in the ring, we’re ready to help you do it. While we’re a global team, our headquarters is in Los Angeles – and we’re always thrilled to take clients on our home turf. Rootstrap is a full-service digital creative studio offering ROI-focused web and mobile app development to the Los Angeles market. We’ve worked with everyone from stars like Tony Robbins to no-name kids out of Idaho, and we’ve overseen more than 250 successful product launches. We don’t care if you have a nearly-finished app with a comprehensive go-to-market strategy or you scrawled down an idea on the back of an envelope in a moment of inspiration. At Rootstrap, we’re here to help you succeed. Mobile app development is the core of our business identity – and as our home city, we have a world-class team of app developers in Los Angeles. Whether the project is big or small, user-facing or B2B, startup or enterprise, Rootstrap scales to your needs. We can offer mobile app development teams of just a single software engineer, but with a global team of more than 60 full-stack engineers, we’re ready to scale with you as your business grows. Our clients range from first-time, solo entrepreneurs to global enterprise organizations, but we bring the same Agile startup ethos to every project we take on. Our focus is on creating apps that generate real ROI. We’ve worked in a wide range of verticals and industries, but in everything we do, we strive to tie every element of the mobile app design and development process to overarching business objectives. We don’t want to just blindly build you a product: we strive to get a comprehensive understanding of your business model, your industry, and where your business is going. We want to understand how mobile app development fits into the overall goals of your organization – because that’s what lets us create a mobile app that truly moves you forward. We use Agile development because it works. Getting a working product in front of users lets us get out of our heads and learn from the people we want to reach with the mobile app – and doing it early in the process lets us ground every decision in what real users want. Whether it’s a simple Android MVP, a massive enterprise iOS app, or some crazy new technology we haven’t even thought of yet, Agile development lets us build functional, beautiful products that generate real ROI for our clients. Don’t believe us? Of course, development is impossible without design – and mobile app design is one of our core service offerings at Rootstrap. In fact, this is so important to us that we have a standalone product dedicated purely to mobile app design: Roadmapping. Roadmapping is the seed from which our greatest projects have grown. It’s a standalone pre-development product workshop that answers the biggest questions before putting down the big money for development: who is this for? Why do they need it? Why is it better than what’s already out there? Roadmapping serves to define your concept, validate it in the marketplace, and build a detailed roadmap to developing the finished product. Now it’s time to bring the baby to life. With a detailed understanding of the concept and core value proposition in place, your app design team will craft a comprehensive, high-fidelity clickable prototype of your product. Our team is global, which gives us the flexibility to work when you do and adjust to any time zone. But LA is our home town, and starting here means you can work with our Los Angeles mobile app developers in person. So who are we? A team of mobile app developers, product fanatics, and dreamers. So you want to build an iPhone app? Good on you. iPhone apps offer a juicy market, and we’ve been building world-class iOS apps for years. Apple’s App Store generated nearly $40 billion of revenue from 28 billion downloads in 2017, and if the trend holds, those numbers will get even larger in the coming years. But a big market does not guarantee a successful product. 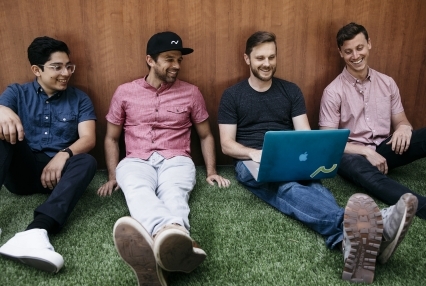 If you want to build a successful mobile app, you need a good team. We’ve got you covered. Our engineers are masters in iOS development, and we’re militant about the code standards for our iOS apps. We’re equally at home in Swift, C, C++, Objective-C, or any other language you want to work in, and our commitment to Agile means we work hard to make sure we’re building as lean and efficient as possible. We’ve also learned a thing or two about what gets apps featured in the App Store – and we’ll work with you to give your product the best chance possible. But beyond technical proficiency, our entire process is built to help you reach positive ROI. From inception to design to development, we ground every decision in the needs of users and the objectives of your larger business. That $40 billion market is tempting, but you have to know what you’re doing to get a piece. That’s what we’re here for. iPhone apps may get more glitz and glamour, but there’s a lot to be said for Android app development. For starters, Android apps get more downloads than iOS apps on the whole. The Google Play store generated 64 billion downloads worldwide in 2017, more than twice that of the App Store. And while it’s nowhere near App Store revenue, the $20 billion of revenue that Google Play garnered in 2017 is nothing to shake a stick at. On another level, Android is a more flexible platform than iOS in a number of important ways. User acquisition costs less for Android apps than iPhone apps, which means it’s cheaper and easier to build a user base for an Android app than on iOS. Furthermore, Google Play allows you to publish updates in just 2 hours – much shorter than the App Store’s waiting period, which ranges from a few days to two weeks. This flexibility makes iterative development easier and faster: it allows us to publish an initial v1.0 on Android, gather data from users, and iterate the app in real time. We always recommend releasing on both platforms, but if money is tight, we’ve seen success by building an initial user base on Android, then launching on iOS once there’s a stronger market position. But ultimately, there’s no right answer here. How you choose to allocate development resources and bring your mobile app to market all depends on the specifics of your app concept, your key value proposition, and your target user demographic. The good thing is that when you work with Rootstrap, we help you answer all these questions before we start building the app. If you’re considering building a mobile app in Los Angeles (or New York, or anywhere else for that matter), we would love to hear from you. We’re always looking for new projects, and we’re interested in talking with you whether you have a detailed plan or just an idea. Drop us a line, even if it’s just for a quick chat. After all, the biggest companies in the world started as just that: quick, friendly chats over coffee. Who knows – maybe we’ll help you start the next one. Anything can happen in this town.